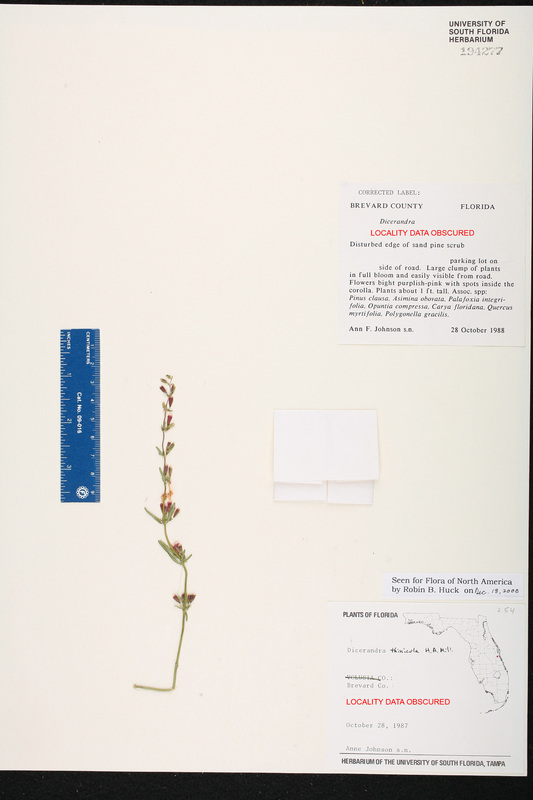 Locality: Florida, Brevard Co., Contact USF Herbarium if additional information is required. 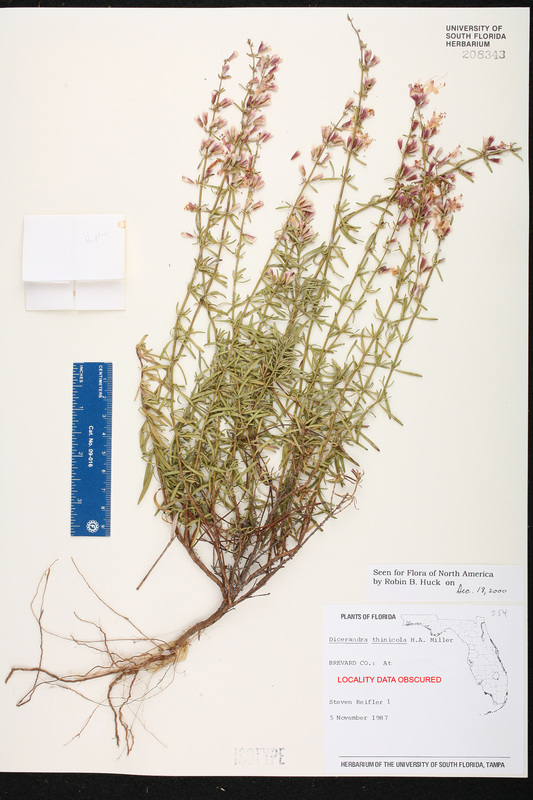 Determination History: Dicerandra thinicola H. A. Mill. Description: Large clump of plants ca. 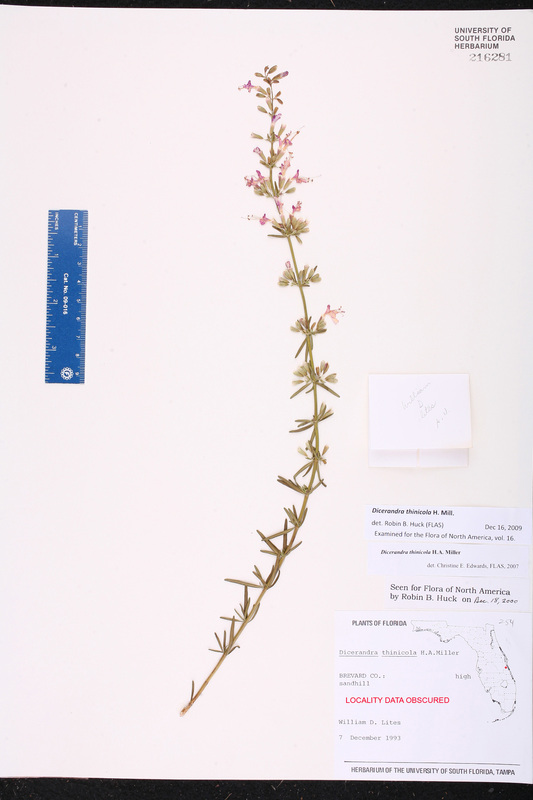 1 ft. tall, in full bloom and easily visible from road; flowers bright purplish pink with spots inside the corolla. 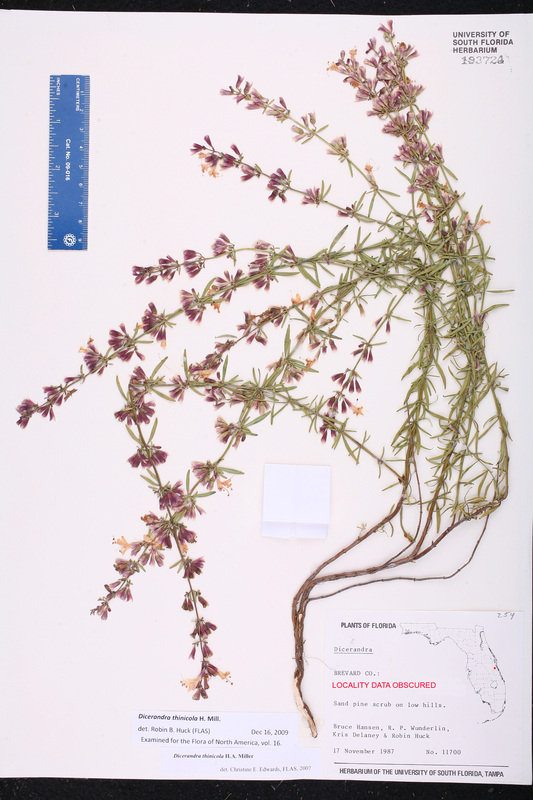 Habitat: Associates include Pinus clausa, Asimina obovata, Palafoxia integrifolia, Opuntia compressa [O. humifusa ?? ], Carya floridana, Quercus myrtifolia, Polygonella gracilis. Collector: A. F. Johnson s.n. 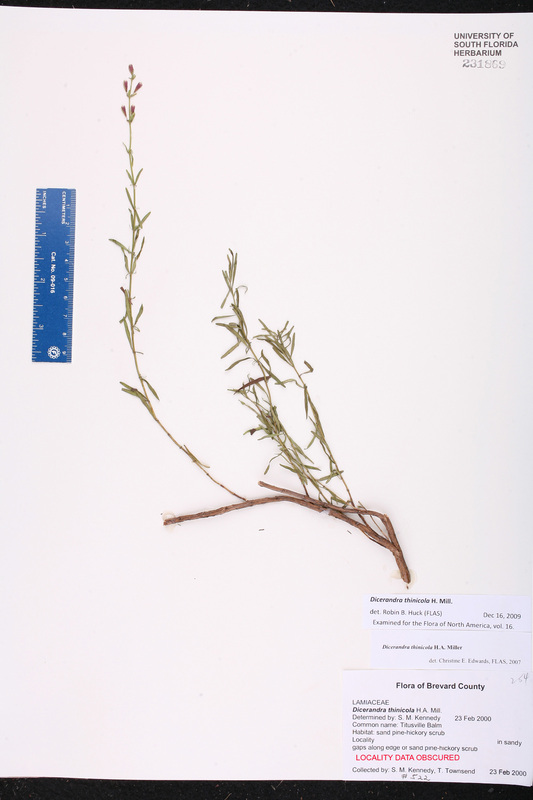 Dicerandra thinicola H. A. Mill. Habitat: High sandhill in and around powerline easement. Collector: W. D. Lites s.n. Habitat: Sandy gaps along edge of sand pine [Pinus clausa] - hickory [Carya floridana] scrub. Habitat: Along powerlines in sandy gaps of xeric oak - hickory [Carya floridana] scrub. Habitat: Sand pine [Pinus clausa] scrub on low hills. 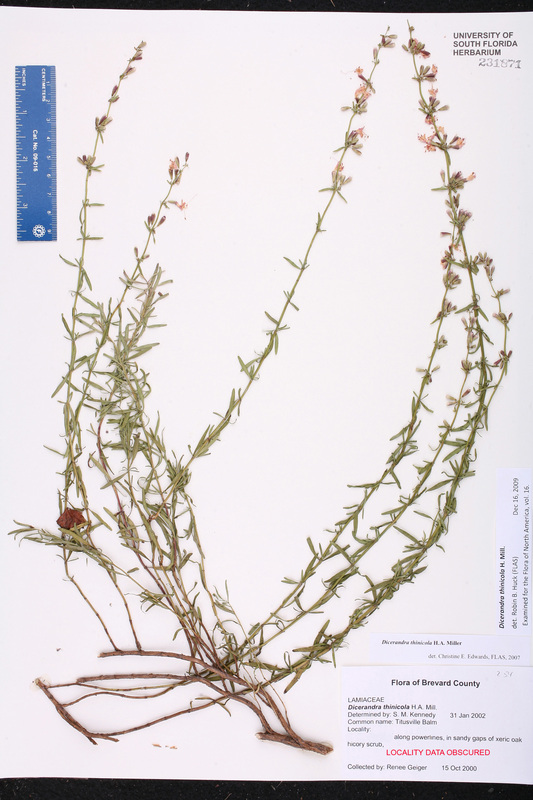 Currently Accepted Name: Dicerandra thinicola H. A. Mill. 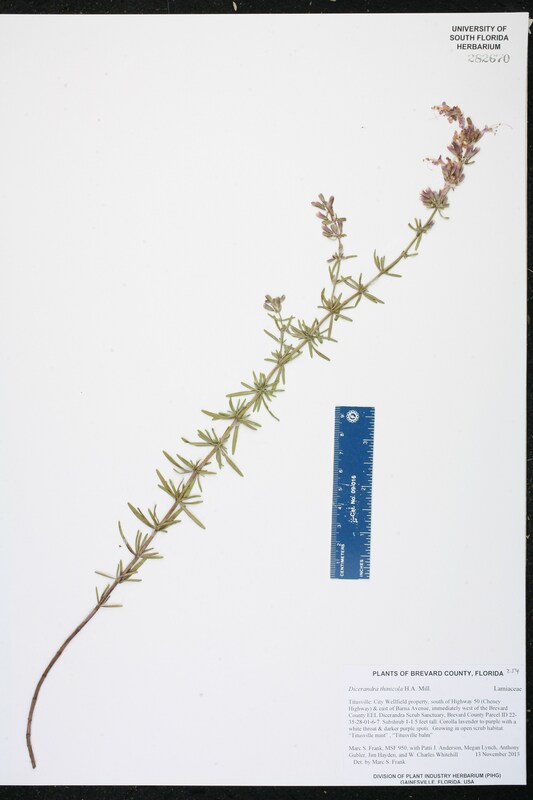 Description: Subshrub 1-1.5 ft. tall; corolla lavender to purple with a white throat and darker purple spots.